Rather than erecting walls, a less permanent option like curtain walls, privacy screens, and thermal and acoustic panels could be the answer. When functionality is at a premium, adding such points of separation can create defined work zones and operational areas without the expense and production interruptions that interior construction causes. Curtain walls are available in a wide range of colors, configurations and sizes that make it easy to create defined spaces for functional work groups. You can have solid colored walls, walls with clear vinyl windows and even doorways designed in them, or translucent walls shielding workers outside the work cell from things like welding sparks and torch arcs while still allowing visibility into the workcell. Curtain walls provide floor to ceiling separation, if you want the walls that high, and one of the best attributes of curtain walls is that they can be opened or closed depending on the operations of the day. So you can also have the benefit of dual functionality in a floor space. The curtains run on tracks suspended from or mounted to the ceiling. Curtain edges seal with Velcro hook and loop tape and you have options of how you want the bottom edge finished as well as optional valances to further restrict particulates at the ceiling level. Warehouse curtain wall with clear vinyl windows and vinyl strip doors protected by safety yellow door guard posts. Another option in defining work space is screens. Whether for privacy, welding safety, or short-term zone definition, vinyl screens provide substantial definition of work areas for small spaces. 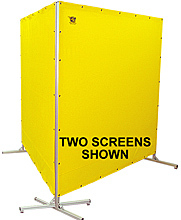 The screens are typically supported on aluminum stands that interlock to create sharp, closed corners and can be ordered in a wide variety of sizes. Also available are curtain walls and screens that perform special functions like the welding curtain walls and screens mentioned above. Beside eye-saving welding screens, there are also thermal walls, clean-room curtains, and acoustic curtains and screens.Acoustic walls and screens aid in reducing the noise levels in a facility by enclosing loud equipment behind an acoustic sound reduction panel. The more enclosed the space, the lower the noise level and lower the risk of hearing loss in that work zone. 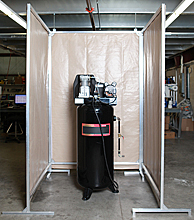 Acoustic curtain walls and screens are a great way to keep compressors, machinery and engines from adding to the din of the workplace. 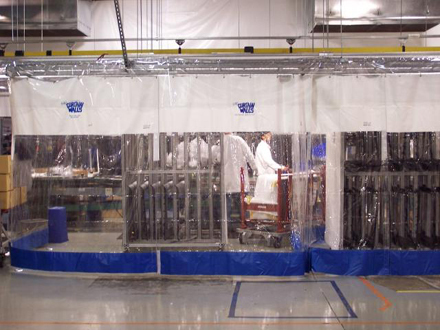 Clean-room curtains are made of a special hygienic vinyl that resists bacterial buildup, is wash-down capable at high temps and provides a way to limit dust, debris and contaminants from infiltrating the clean-room space. Thermal walls help contain differing thermal zones within their own spaces. They help you with keeping cold storage cold and utilizing unused space for other needs. Vinyl strip doors fall into this thermal barrier area. 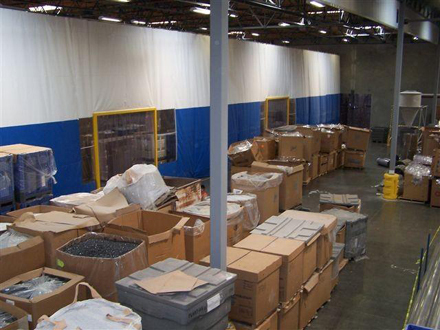 With vinyl strip doors you provide a thermal barrier that has the flexibility of letting transport equipment and personnel through while still protecting the thermal zone being entered. The vinyl strips are easily pushed out of the way as equipment and people pass through but quickly drop back into place once no longer obstructed. With curtain walls, screens and specialty curtains you can re-define the work zones in your facility, limit the flow of airborne particulates and contaminants, and reclaim functional space through separation of operations. Gain the benefit of dual functionality for certain spaces and protect non-zoned workers from the dangers of welding torches, loud noises, paint bays, and the like. Expand the types of operations that can be performed within existing space. As your operations grow and change, keep in mind how well curtain walls and screens provide flexibility in how you use the space you have.